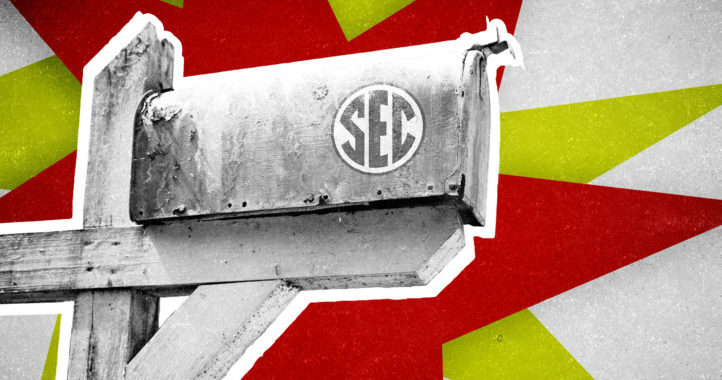 The SEC lost a few talented receivers to the NFL this offseason, including guys like Alabama’s Calvin Ridley and South Carolina’s Hayden Hurst, who were first-round draft picks. However, the conference is still full of talent at the wide receiver and tight end positions, and 2018 should be another big year for a handful of offenses that have the most returning talent in their receiving corps. 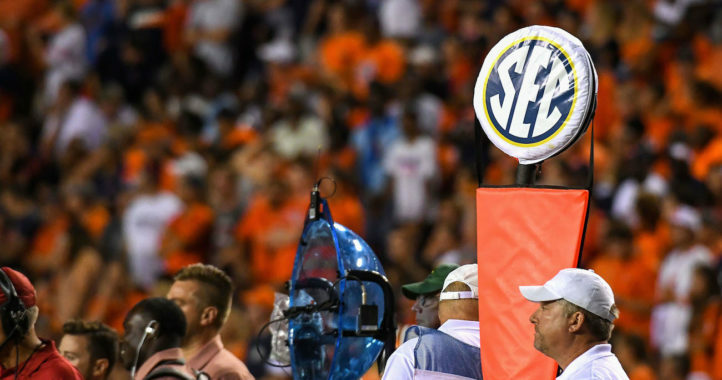 Returning talent: Jerry Jeudy, DeVonta Smith, Henry Ruggs III, Irv Smith Jr. Losing Ridley is devastating for the Alabama offense, as he compiled a disproportionate amount of the Crimson Tide’s receiving yards last year. However, even without the first-round NFL Draft pick, the Alabama cupboards are far from bare. This ranking is based mostly on potential, but Jeudy and Ruggs were 5-star recruits, DeVonta Smith was a 4-star player, and Irv Smith Jr. was a 3-star player. Unlocking their immense talent will likely depend on who is the team’s starting quarterback, as there is a battle between Jalen Hurts and Tua Tagovailoa, with Tagovailoa being the more polished passer at this point. If he wins the starting job, the sky is the limit for this talented group of young receivers. Hurst did a lot for the Gamecocks, and was often QB Jake Bentley’s safety net over the middle of the field. However, Bentley will still have plenty of big-time targets this fall. Samuel could have declared for the NFL after getting hurt as a junior, but the elite receiver/kick returner chose to return to Columbia for one last ride with the Gamecocks, giving South Carolina a centerpiece for their receiving corps. Then you get to Edwards, who is almost criminally underrated at this point. Add in guys like Shi Smith and OrTre Smith, and this is a deep receiving unit that will be just as dangerous as it was in 2017 with Hurst manning the tight end spot. Auburn remarkably returns all of their major pass catchers from last season, and also brings back star QB Jarrett Stidham. The only real loss in the Tigers’ passing game is RB Kerryon Johnson, who made some big plays catching the ball out of the backfield. However, it is worth noting that both Eli Stove and Will Hastings tore their ACLs this spring, so it’s unclear whether either will be able to play much (if it all) this fall. That still leaves the Tigers with guys like Davis, Slayton and Craig-Myers, though, and that’s an arsenal that many SEC teams would love to have. The question marks in the running game are significant, but Stidham should be able to take a step forward in the passing game and make the Tigers’ aerial attack even more dynamic than it was in 2017. Most importantly for the Tigers, star QB Drew Lock is back for his senior year, and he has serious Heisman potential. Yes, the loss of Moore to the NFL hurts, but Lock’s supporting cast is still full of talented pass catchers. He has his deep threat in Hall, who led the SEC with nine receptions of 40 or more yards in 2017. He has Johnson, who is capable of turning even a simple screen pass into a long touchdown. And he has a rising star at tight end in Okwuegbunam, who saw 11 of his 29 receptions go for touchdowns last season. If guys like Richaud Floyd and Nate Brown step up, the Mizzou offense should continue to be one of the best in the SEC, even without a star like Moore. Getting Brown back alone would be enough to put the Rebels at the top of this list, as he led the SEC in receiving yards and tied for the lead in touchdowns last year. However, breakout star QB Jordan Ta’amu also gets to throw to D.K. Metcalf, who is a sophomore built like a tank, DaMarkus Lodge and a rising talent at tight end in Dawson Knox. Yes, losing Jefferson to Florida hurts, but not enough to keep the Rebels from the top spot. 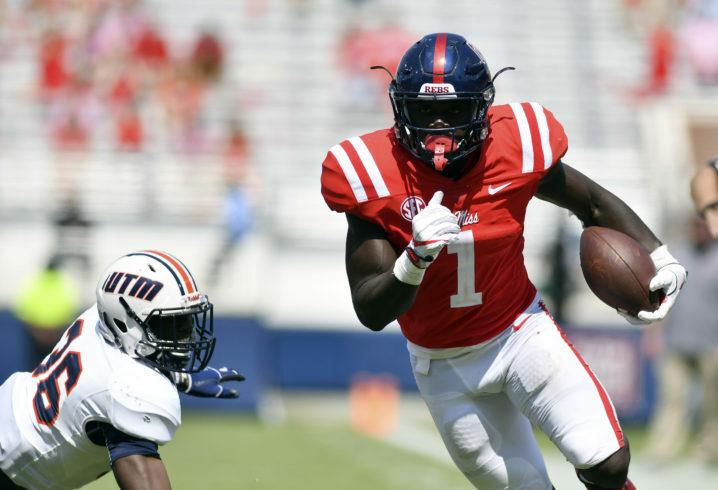 Even though the Rebels are entering their final year of a two-year postseason ban, this offense will be one of the best in the country, and Ta’amu and Brown should form the best quarterback-receiver tandem in the SEC. I’m excited about our guys, but 2nd best group in the SEC? Might be a stretch there. It appears Adam has been reading some of our comments though, the fan base has been heard. Mizzou’s receivers are not a weakness. Did Alabama’s playbook give their receivers and quarterbacks a chance to be ranked? They are going to catch you over 4,000 yards of passes from Tua this fall. Not gonna happen. It would take a lot of close games before Alabama has to rely on either of its’ QB options that much. Yeah, I doubt Saban suddenly changes his identity. They’ll ride Najee Harris to the championship. Tua will have a decent season, but it’s not nearly as difficult at Alabama when opposing defenses have to throw the kitchen sink at bama to stop the running game. No way are they going to ride Najee considering the leading rusher who has broke 1k yards in back to back seasons returned….